Here are 6 face masks you should try out depending on your needs. Not only do oranges make a healthy refreshing drink, the pulp you usually throw away can be used for a great face mask that’ll leave your skin glowing. Use the pulp on its own or mix it with honey, oatmeal & yogurt. Blend 1 cucumber & mix the paste with a little bit of yogurt to revitalise your skin. Make sure you don’t put too much yogurt in otherwise it’ll be too runny. The yogurt also helps for sunburn, so in summer this really comes handy. This homemade revitalising mask will not only refresh & cool your skin in the hot summer months but will clean it too. If you have blackhead & whitehead problems then this is for you. You’ll need half a cup of cucumber solids blended & strained. Put it into a saucepan, heat with some fresh water & then add your chopped mint leaves & heat some more to help the ingredients blend well. Leave the mask to cool down. Apply & leave for 15 mins before rinsing off with warm water. This tropical mask is revitalising & the leftovers can be eaten. You need to mash 3 papaya slices, 2 mango slices & 1 pineapple slice. Add 1 tbsp of warm honey & you’re done. Leave the mask on for about 15 to 20 mins & rinse off with lukewarm water. This can be used as an all-natural astringent for people who have problems with big pores. Mash about 5 big strawberries & mix with 1 or 2 tbsp of honey. Leave on for 10 to 15 minutes(or even 30 mins if you want) & rinse off using a gentle circular motion. This helps exfoliate & soothe, while the honey helps soften & gives an instant glow. Herbal teas can be used for great masks. Use chamomile for nourishing, mint for revitalising, lavender for soothing & sage for deep cleansing. The process is pretty simple – just prepare the herbal tea as usual & leave to cool. Dip pads of cotton or cloth in it & then hold it on your face. Here are 8 amazing exfoliators you can try out. For a basic exfoliator check out the exfoliator recipe used in my previous exfoliation posts. The lavender is calming, the coffee grounds help with cellulite. This scrub also helps calm your blemish-filled skin. If you have been having problems with oily skin then this will help you. The lemon juice wipes away all the oil & the salt takes care of the rest. This softens rough skin & the strawberry seeds work wonders for clearing any dead skin. This softens skin, but also helps remove oil if you are having problems with oily skin on your face or anywhere else. Epsom salts are some of the purest salts in the world! They feel great in the bath and brush away all dead skin cells leaving your skin super soft. This super sweet scrub softens your skin & makes it glow & look radiant. Brown sugar can be used in a paste(brown sugar + water) or just straight brown sugar. It softens your skin super quickly. This is effective for hair growth & care. You’ll need natural henna powder, an egg, half a cup of lemon juice & a cup of water. Mix the henna, egg & water together until it has formed a paste & let it stand for an hour. Add lemon juice & blend again until the mixture is smooth. Apply the paste on your scalp & hair from root to tips. Leave it in for about 2 hrs or until completely dry or even through the night. Rinse with cool or lukewarm water & gently work the mixture out of your hair. Use once a month. Get half a cup of oats or more(depending on the length and thickness of your hair), mix it with 1-2 tbsp of almond oil & a quarter to half a cup of milk. Make sure your hair is tangle free & dry & apply the hair mask from root to tip. Leave it in for 15-20 mins & then rinse with warm water before shampooing. Use once a week. You need 1 egg, a quarter cup plain yogurt & a quarter cup mayo. First beat the egg until it looks foaming, add in the yogurt & mayo until the mask is smooth. Massage it into your scalp & hair, making sure every inch is covered. Use a plastic bag or shower cap to keep it from dripping & leave the mask in for an hour. Rinse with cool water & a very mild shampoo. Use it once a week. This is helpful if your hair is thinning or you’re losing it. Juice one small onion & add a bit of honey. Apply the mixture to all of your head or just the spots where hair looks thin. Leave it overnight & avoid covering it(you can cover your pillow) & shampoo out the next morning. Use at least once a week. This doesn’t just help strengthen your hair for fast growth but gets rid of dandruff quickly. Just mix one part lemon juice with two parts coconut oil & massage it into your scalp. Leave it in from 4hrs to overnight & gently rinse out with cool water the next morning. Use this once a week. This one is complicated but only because it has many ingredients. You need 1 tbsp of garlic juice, 3 tbsp chamomile tea(or a tea bag), 1 tbsp aloe vera gel, 1 tbsp honey, 3 cups of water & 1 egg yolk. Mix the garlic juice with the honey & place it in your fridge. Boil your water & tea for about 30mins, stirring now and then. While that cools, take your juice/honey mixture & stir in the egg yolk & aloe vera gel. Massage the mask into your scalp down to the ends of your hair & leave it for 20 mins. Wash it out with a gentle shampoo. After that rinse your hair with the chamomile & let it stay in. If you have the stamina for this process you could do it once each week. This one is easy if you have all the ingredients together. Have a bottle handy & combine a quarter cup of vitamin E oil & a quarter cup of jojoba oil. You can buy vitamin E capsules & either break them, press them or piece them to get the oil. Then add 15 drops peppermint essential oil & 15 drops rosemary essential oil. Cap the bottle & shake the mixture well. Apply this treatment to your scalp every night. This requires only essential oils. Mix 2 drops thyme, 3 drops rosemary, 2 drops cedar, 28mls grape seed & a tbsp jojoba oil in a tight bottle or bowl for storage & later use. Massage this mixture into your scalp every night. This requires caffeine powder. You mix 4 tsp into 230ml shampoo. You can also mix he caffeine powder in a spray bottle with 230ml water & spritz it on your hair 10-15 mins before showering. Don’t use this treatment more than once a day & if you start getting headaches, you’re using too much shampoo or spritz. All you need is mayo & it doesn’t matter what kind. Make sure your hair is damp – not soaking wet – with warm water & basically rub the mayo into your scalp & down to the ends of your hair. Use as much or as little as you want. Cover with a shower cap or plastic bag to trap heat. Let it set for 20 mins and then wash out with a gentle shampoo or shampoo that has been diluted. Use once a week for dry, over-processed hair, twice a week for normal hair & once a month if you have oily hair. You’ll need to get fresh curry leaves & some coconut oil. Boil them together until a black residue starts forming. Harvest this residue & use twice a week to replenish your hair, grow faster & fight gray hair. This oil is pretty greasy which means you may want to dilute it to avoid too much hassle. Just add it to your conditioner or mix with almond oil & massage into your scalp. You could also massage some castor oil into your scalp alone & leave overnight if you have serious receding hairline, bald or thinning hair. Use it once a week. This helps restore your hair’s optimal pH value, seals cuticles to make each strand shinier, stronger & less prone to breakage & removes product build-ups that suffocate the scalp & slow down normal hair growth. Mix 1 part vinegar & 2 parts water together & use this mixture as a final rinse after shampooing. This will make your hair softer, shinier, healthier & longer as it is filled with rich proteins, vitamins & super-nurturing fatty acids. Mix 2 egg yolks with 2 tablespoons(tbsp) of olive oil, dilute by adding a cup of water & slowly massage this mask into your scalp. Give 15 to 20 mins to absorb all the needed nutrients & then rinse off. Use it once or twice per month. This prickly purplish flower is jam-packed with nutrients & is good for your hair as it contains calcium, potassium, iron, vitamins & much more. It nurtures hair & helps battle some of the worst scalp problems – like inflammation, dandruff & skin conditions. Mix 1 teaspoon(tsp) of each – rosemary, basil & lavender oil, then mix in 3-5 drops of the mixture with 1 tsp of Aloe Vera gel & 1 tsp Burdock oil. Massage the mixture into your scalp leaving it on for as long as you want(the more hours, the better). Then shampoo & style your hair as usual using it at least once a week. This leaves your hair soft & stimulates hair growth. Mix 2 tsp of dry crushed rosemary leaves with 300mls water & then massage this mixture into your hair & scalp starting from the ends. As it is non greasy it doesn’t need to be rinsed out & you don’t need to wait til your hair is dirty to apply it. Use it after shampooing. Bananas are rich in potassium as well as vitamins A, E & C & calories which makes them perfect for hair growth treatments. Pick 2 soft, ripe banana, mash it into a paste & apply to your hair & scalp. Make sure the bananas are really well mashed because big pieces are hard to get out your hair. After applying, cover your head with a plastic bag. Wrap your head in a hot towel or use a hairdryer to help your hair absorb all the nutrients quickly. Use once a week. This adds lustre to your hair if it’s dry, it gets rid of flaking & dandruff & keeps your hair safe from the sun, which can be just as damaging to your hair as your skin. Microwave the coconut oil for about 10 seconds, then massage 1 tbsp of it into your hair from the roots to tips. After that, massage the avocado into just the tips of your hair. The avocado could be replaced by avocado oil if you like. Leave this mixture on for 10-15 mins & then rinse with cool water before shampooing. Use once a week. Use if you’re trying to grow out your hair, soften it or strengthen it. Use about 1 tbsp or more depending in the length & thickness of your hair & massage it into your scalp, down to the ends of your hair. Leave for 15 mins or so before rinsing with cool water & shampooing. Use once a week for nourishment & twice a week if your hair is dry or damaged. This is extremely effective but is complicated. It helps if you have thin hair – for growth & thickening of hair. You need 28g of nettle leaves, 2 cups of white wine vinegar & 2 cups of water. Place it all in a pan making sure it is non-reactive, let it simmer on the stove for about 2 hrs & let it cool before straining the mixture. Once you have strained the mixture, stir in 2 drops lavender oil & pour the mixture into a tightly sealed bottle. Shake it well before using & massaging it into your scalp. Use it every other day(or night). Exfoliating is an important factor for healthy looking and feeling skin. Although soap cleanses the skin, a sugar scrub can remove dead skin cells and excess oil. It can help unclog pores and keep your skin nice and even. The natural ingredients in homemade sugar scrubs won’t be harsh on your skin and the oil will also help to re-hydrate and moisturize. 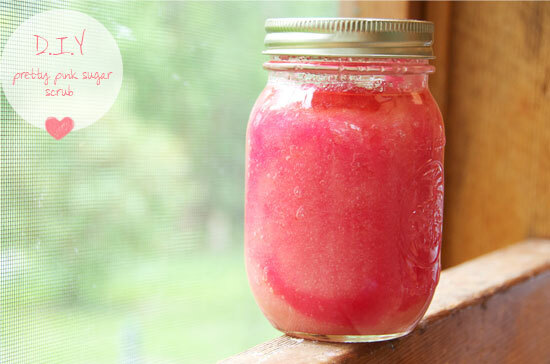 A basic sugar scrub recipe allows you to experiment and personalize your own mixture! Lemon juice is also a natural exfoliator and can add an extra burst of energy! Add a bit of food colouring in your scrub to make it pretty!